Interior designer Jessica Helgerson and her husband, architect Yianni Doulis, bought five acres on an agricultural preserve ten miles from downtown Portland, Oregon, in 2010. The land came with two buildings, one of which the pair immediately began renovating into a weekend retreat. 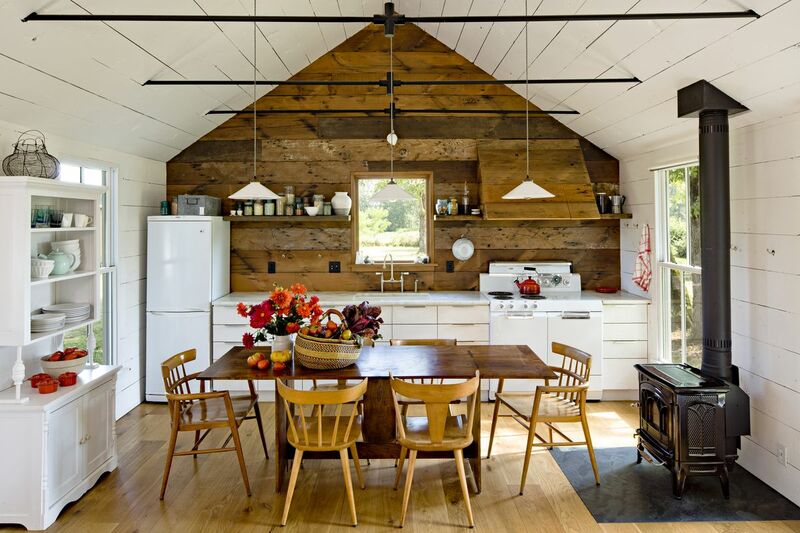 The small 1940s cabin had already been poorly remodeled, so they gutted it, vaulted the ceiling, added new windows and doors, and reconfigured the entire floor plan. Once it was all done, they spent their first weekend there for Helgerson’s birthday—then never left. They spent the following four years living in 540 square feet with their two young children. (They’ve since moved into a newly built home on the same property). Here, Helgerson shares her time-tested strategies for a successful small-space redesign. “It starts with a logical layout,” Helgerson says. When working with a client, Helgerson will identify their spatial needs and how they’ll use their home. She asks questions about their lifestyle, such as whether they like to entertain or need home office space, and their answers inform the final floor plan. For her home, Helgerson’s primary goal was to host overnight guests. “It was important that it be a house where we could welcome friends, even though it was small,” she says. That’s why her layout incorporates lots of crash pads, including a bunk bed and a guest bed in the back bedroom, as well as a sleeping loft, and living room couches that double as beds. “We definitely worked in storage everywhere we could,” Helgerson says. This started with the hood vent in the kitchen. The range is a vintage Craigslist find and has a unique stovetop layout with burners isolated to the left side. So Helgerson designed the hood vent to be directed over the burners and used the remaining space to conceal a pull-out spice rack. Storage was also added in other overlooked corners: There are drawers under the couch and guest bed, bookshelves in the great room, recessed storage in the bathroom, two hall closets, and a pull-out closet in the kid’s room. Helgerson wanted “as little floor space devoted to circulation as possible,” she says, as hallways, stairwells, and walkways through rooms can be major space hogs. 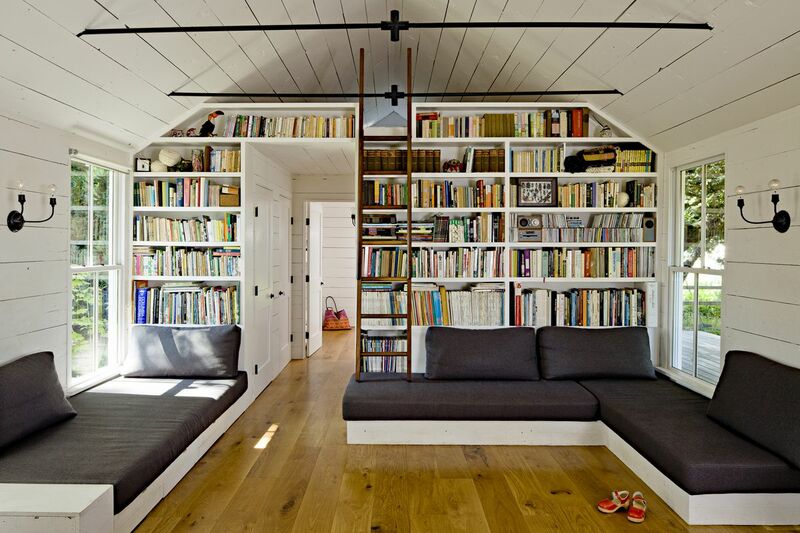 While trying to achieve this, she hit upon the idea of built-in living room couches. “It was kind-of an epiphany,” she says of the sofa designs. “And we’ve wound up using them over and over in lots of our projects.” The sectional design was a deviation from her original layout, which included four chairs. Helgerson lowered windowsill heights in order to let in as much natural light as possible and expand sightlines beyond the interior. “When you’re sitting on the couch and you open those windows, you’re just outside, which is really pleasant,” she says. As a bonus, having low windowsills also provides fun alternative entry and exit points for the kids. The sleeping loft. 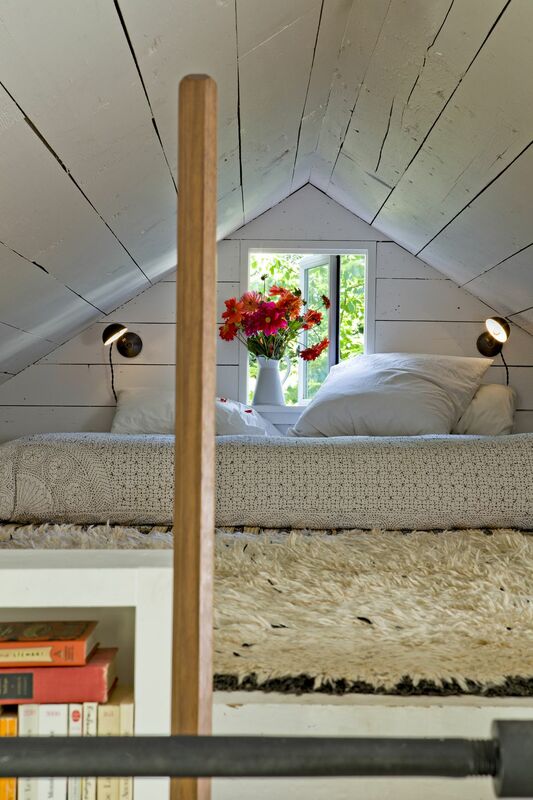 Photo by Lincoln Barbour courtesy Jessica Helgerson Interior Design. “Think carefully about every object, more so than ever. Ask, is it beautiful? Is it useful?” Helgerson says, paraphrasing British textile designer William Morris. For Helgerson, items that were worth keeping included the dining room table crafted by her husband and the vintage hutch that stores everyday dishes. When asked if using a strict color palette was a necessity for a small space, Helgerson says no. “It depends on taste and what you enjoy looking at,” she says. “This felt clean and simple to us, but I think it could be colorful as well.” A home’s design evolves with its occupants, just like in the case of the tiny house. “It really came together organically,” she says. Allowing for the more serendipitous aspects of the process is what ultimately makes a home uniquely yours.